New 3-Year Warranty on ClearChart® 4 Digital Acuity Systems. Buffalo, NY – Reichert Technologies® announces an extension of the warranty on its family of ClearChart® 4 Digital Acuity Systems to three years. The new 3-year warranty is available for the AcuityChek™, ClearChart 4, ClearChart 4X, and ClearChart 4P models. Reichert has decided to enhance the ClearChart experience by offering this new industry-leading 3-year warranty. Since the launch of the ClearChart 4 Digital Acuity Systems two years ago, it has had an excellent record of quality and reliability. 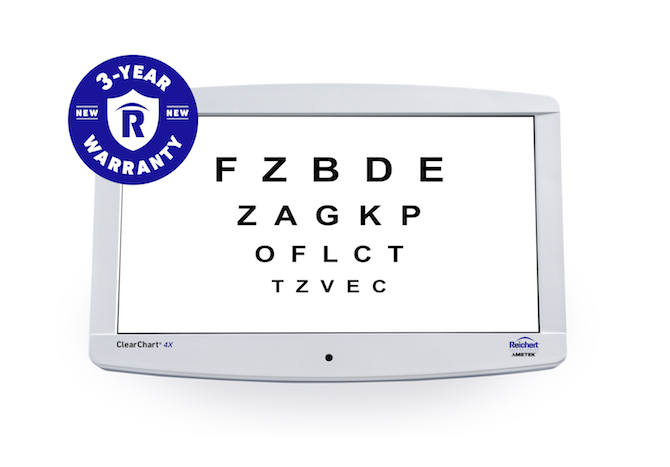 This new, longer warranty provides eye care professionals with confidence in their choice of the ClearChart. The family of ClearChart 4 Digital Acuity Systems is an all-in-one, elegant, simple-to-use, and uniquely developed system designed to meet all acuity testing needs with a wide selection of optotypes and other special test charts. The systems are designed, engineered, and assembled in the United States especially for the practice that is passionate about the patient experience. The ClearChart 4 Digital Acuity Systems feature a new 24-inch, high-resolution, LED backlit display that is lightweight, cool running, and long-lasting. Its intuitive user interface, whether controlled from an easy-to-use infrared remote, the Phoroptor® VRx Digital Refraction System or SightChek™ Digital Phoroptor, provides the best user experience of any digital acuity chart. This warranty change is retroactive and applies if repairs are needed for any ClearChart 4 Digital Acuity System within 3 years of purchase. Reichert Technologies, Buffalo, NY, has been a global leader in the design and manufacture of high-quality vision testing and eye care diagnostic devices for optometry, ophthalmology, and retail eye centers for more than 150 years. As inventors of the Phoroptor®, Lensometer®, and Non-Contact Tonometer, Reichert continues its American-made tradition by providing ground-breaking products, including the digital Phoroptor® VRx, Tono-Pen® Handheld Tonometer, ClearChart Digital Acuity Systems, and the revolutionary Ocular Response Analyzer® featuring Corneal Hysteresis. Reichert Technologies is a unit of AMETEK Ultra Precision Technologies a division of AMETEK, Inc., a global leader in electronic instruments and electromechanical devices with annual sales of $4.3 billion.